The treasures found on Lolland date back about 1500 years. The biggest prize is an amulet depicting the Norse god Odin with a horse, in the foreground. 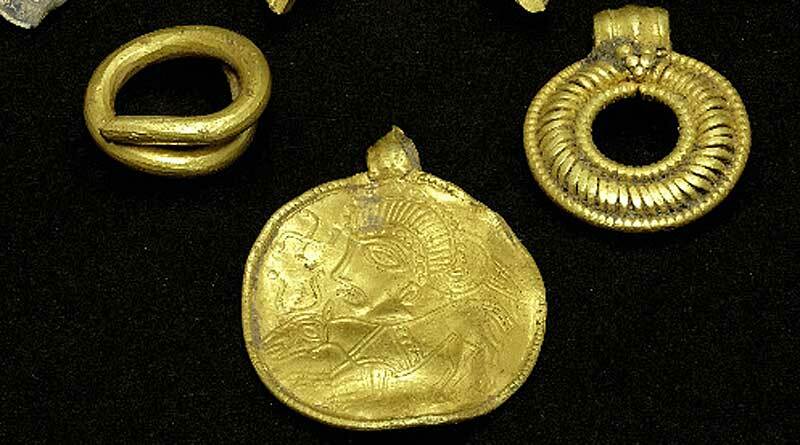 A 1500-year-old gold amulet unearthed by fossickers with a metal detector on an island in Denmark includes a stunning depiction of a horse. It was among a collection of remarkable pieces found on the northwest corner of Lolland, the fourth largest island in Denmark, by Carsten Helm and his sons, Lauritz, 12, and Luke 10. Their discoveries have caused a stir among archaeologists at the Museum of Lolland-Falster. The biggest prize in the collection is the round, thin gold disc with a decorated front, which is framed by a perlet gold thread. It was created with an eyelet, enabling its owner to carry it in a cord or chain around his neck. The disc is decorated with a picture of a man’s head floating above a horse. The subject is believed by experts to be the god Odin, based on conclusions from other historic finds. The belief that it is Odin is given further weight by the runic inscription of the word “High”, most likely a reference to “the High one” – one of Odin’s nicknames in the Viking era. The floating head above the horse is believed to be that of Odin. Only three similar finds have ever been made on Lolland, the last one in 1906. She said the disc appears to reference Odin as a shaman. Shamanism is an ancient religious practice, with the image being a representation of the journey of Odin’s soul to another world. Another interpretation of the subject relates to Odin’s magical abilities as a healer of sick horses. In this part of the Iron Age, the horse was a valuable and important means of transportation, so it made sense that people would have sought the help of the gods to keep animals safe. “It tells us something about how Iron Age humans related to their world and their gods, and how to use magic,” she said. The gold disc would have valuable in its time, and it is likely that only society’s elite could have afforded to buy this kind of amulet to help provide such protection, she said. The other items found nearby were another gold pendant, three severed gold pieces, probably from neck rings and a gold ring. In addition, the trio found some severed pieces of silver, which probably came from jewelry. It is possible that all the objects were buried there around 1500 years ago either as a tax or as a sacrifice to the gods. It is probably no coincidence that the treasures were buried in this area in the 500s. “It is possibly linked to a major natural disaster that took place in 536 possibly,” Brinch said. “Written sources from both the Roman Empire, Europe, Middle East and even China tells of a year when the sun was not shining and there were frosts in summer. “We do not know exactly what happened, but there are indications that a violent volcanic eruption or a meteor strike had thrown ash or dust in the atmosphere and thus caused a prolonged period of reduced sunlight. The golden treasures might represent a local person’s fear of the end of the world, she suggested.